Combines functions of DMM,switch system, and datalogger True 6-.5-digit (22-bit) resolution Choice of 12 switch/control plug-in modules Up to 200 differential input channels (with 300V isolation) for measurement and control 1 uOhms resolution Convenient front panel inputs Free TestPoint start-up software Free LabVIEW, LabWindows/CVI, Visual Basic, C/C++, and TestPoint drivers (IVI style) GPIB, RS-232 communications capabilities Optional ExceLINX-1A datalogging software The Model 2700 Multimeter/Data Acquisition System is a high-performance, half-rack instrument that combines the functionality and high channel count of a datalogger with the accuracy, convenience, and stability of 6-1/2-digit DMM for the price of a high-performance PC plug-in board. Compatible plug-in modules provide the Model 2700 with the industry'''s lowest per-channel installed cost in a high-performance data acquisition and control package. The Model 2700 can provide up to 80 differential channels of multiplexed measurement and control to offer significantly more channels in less space than competing solutions. 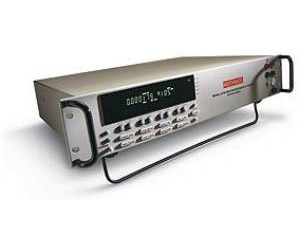 The Model 2700 is ideal for signal levels beyond the capabilities of ordinary plug-in data acquisition cards, including high voltage, high current, and direct ohms measurement with the equivalent of 22-bit A/D resolution. A variety of system level control functions enable the Model 2700 to control power to the DUTs, switch loads, and perform general signal routing.